We are located within easy walking distance of the train stations at Museum, Town Hall and Central. Those traveling by car can find several car parks in the vicinity, as on-street parking may not be easily available. 1. Virtually all the information on consular services has already been made available online on our websites (HCI Canberra; CGI Sydney) and on the VFS website. 2. Consulate would prefer all communication to be in writing, on record. 3. Consulate does not provide information on status enquiry for various Consular services. 4. Due to the high volume of calls, your calls may sometimes be on hold or unanswered. We apologize for any inconvenience caused due to this, and urge you to send an email to the appropriate person from the list provided below. 5. Only e-mails pertaining to issues beyond the information available online will be answered. 6. When writing to us, you must include your full name, postal address, and phone number. As Consulate receives a large volume of e-mail, we will not be able to answer e-mails that do not include such basic information. Note:Consular queries will not be entertained on General, Trade & Investment and Feedback addresses. Please write only to the email addresses provided above for Consular Services. Emergency Visa is only issued in case of genuine emergency like death or serious illness of immediate family member (blood relation). Application for Emergency Visa with relevant documents should be submitted at the VFS centre Sydney/Adelaide on working days between 0830 hours to 1500 hours and at the counter of the Consulate after 1500 hours up to 1730 hours. Emergency Visa applications on holidays would be received at the Consulate between 0900 hours and 1500 hours only by prior appointment, on the telephone number mentioned below. Production of confirmed flight ticket for urgent travel at the time of application for an Emergency Visa is mandatory. The emergency visa number will be available only on public holidays and weekends. 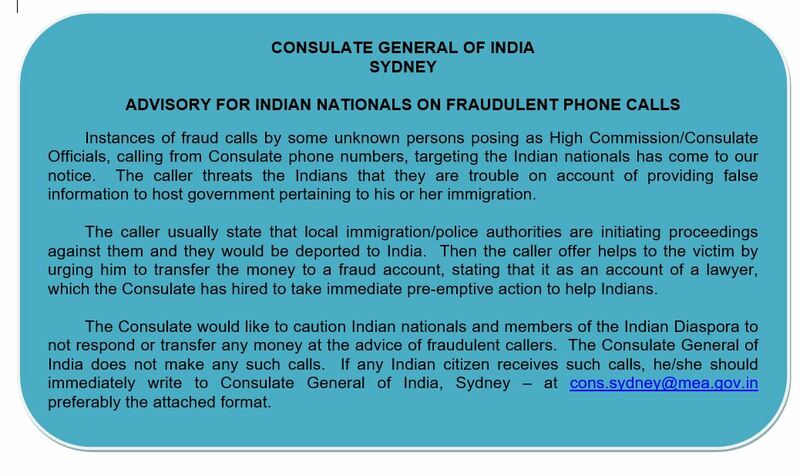 Note: Consular enquiries would not be accepted on Emergency Visa contact number. Please also note that there is no facility of "emergency passport" or "emergency PIO/OCI" etc. This emergency facility is only for visas.